Usually when I start out this column, I begin with a few observations about the Portland Trail Blazers: the play of a certain player, a trend that the team is going through, that kind of thing. It helps me get in the flow of doing previews, and provides needed review or backstory or highlights. In honor of the Thanksgiving holiday here in the United States, which is on the 22nd this year, I’d like to do something different. During this time of year, it can be difficult to take some time to reflect on the past year; with Christmas shopping, family gatherings, travel, and other nonsense, the holidays can seem like one huge blur instead of a quiet time of contemplation. Most folks don’t take much time to think about what they have to be thankful for, even surrounded by family. As for me, I have no extended family I want to go see. My Uncle Richard, who’s probably the closest of our relations to my brother and I, lives in Las Vegas, and I have no real desire to go back to the desert anytime soon—I’d likely spend too much time gambling anyway. My cousins Rachel and Melissa live in Vegas as well, while Melissa’s twin brother Patrick has his own family somewhere in Ohio. My cousin Cindy and her brood live in Central Texas, a place even more unappealing to me than the Mojave. I enjoy living here among the trees, mountains, rivers, and clouds; Cindy’s home is surrounded by red dust, an environment more suited to Mars than Earth. As far as I’m concerned, spending hundreds of dollars to go visit people I barely know is a poor usage of resources—they may have been family to my late father, but they’re strangers to me. I admit to some loneliness. Everyone in my generation of the extended family has a spouse and/or children by now. Hell, even my brother is about to celebrate a two-year anniversary with his ladyfriend, and will be spending Thanksgiving with her. As a dedicated bachelor, I’ll be spending the holiday alone, the first holiday season without my Dad around. I miss him terribly…and not just because he cooked a damn good turkey. I’m thankful for a slow-cooked ham, doused with cherry cola and slathered in pineapple, a mix of the sweet, salty, and savory tastes that I like so much. I’m thankful that Damian Lillard still calls Portland home, and is putting his prime years to epic use for Rip City. I’m thankful that my young apple trees have survived the windy season so far, and their reward will be an extensive weeding, more fertilizer for the winter and brand-new mulch—as soon as the second one stops being stubborn and drops its damn leaves. I’m thankful that the NBA has been more exciting than ever, even in the face of the inevitable Golden State Warriors championship win in June. I’m thankful that my brother has done his best to help me with my finances, just as I’ve done my best to help him adjust to life without Dad. I’m thankful for Evan Turner taking a bench role, and rediscovering some of his old Boston mojo—the mojo that made Neil Olshey sign him to that odious contract. It’s the freakin’ holidays, though—only positive stuff today. I’m thankful for re-entering the Magic: The Gathering scene in Portland, just in time for the return of the beloved setting of Ravnica with the Guilds of Ravnica expansion set. It’s also been nice to rediscover some old, familiar faces, and see how the kids have grown; some of the guys playing now and working in the card shops used to watch me play as children, which is both flattering and makes me feel much older than 32. I’m thankful that Zach Collins looks like a hit in the 2017 Draft. Trading up for him was a good decision by the Blazers’ brass. I’m thankful for my friend, Bryant Knox. Bryant is a regular contributor for Oregon Sports News, and he’s also our editor. His skills make my writing presentable to the public, and his genial nature and wit are always welcome when we get together to share a beer. I’m thankful for the announcing skills of Kevin Calabro and Lamar Hurd. After years of drifting around in the Mike & Mike wilderness, hearing the smooth vocals of Calabro and listening to the solid analysis of Lamar is a real treat—I wouldn’t be surprised if either one was poached for playoff duty this season, if the Blazers are unlucky enough to miss the postseason. I’m thankful for red ale and Irish whiskey. Little-known fact: when you talk about the Irish version, you always have to spell it whiskey. Otherwise, a leprechaun will appear out of nowhere and crack your shins with a shillelagh. I’m thankful that the Blazers got out to a decent start this season, despite the tough schedule. Making hay now will only help in the long run. I’m thankful that 2019 is around the corner, and I’m close to putting one of the worst years of my life firmly in the rearview mirror. And lastly, I’m thankful to you, for reading this. I may not know you, or ever get to meet you, but that anyone takes time out of their day to read my stuff—wherever it goes—means more to me than I can ever express. The Skinny: At a humble 4-12, with franchise cornerstone Kristaps Porzingis out for most of the year and teenage forward Kevin Knox starting slow after his own injury issues, the Knicks are in the dumpster as usual. What’s not usual is the whiff of optimism around the franchise, and the patience they have. Past Knick regimes would happily mortgage the future for the chance to chase unrealistic goals under delusions of grandeur. I know that James Dolan is likely itching to make a deal—having a two-way player (Allonzo Trier) be third on your team in scoring isn’t ideal—but so far, the Knicks’ better angels are prevailing. If by a fingernail. If New York can stay patient, it’ll have Porzingis back at full strength next season, Knox and Frank Ntilikina will be a year older, and they’ll have a high draft pick in the loaded 2019 NBA Draft. All the Tim Hardaway potato chip stats, all the Frankie Smokes bricks (he’s shooting 34 percent on the year), and all the growing pains from Knox and center Mitchell Robinson won’t matter at all next season. Matchup to Watch: Tim Hardaway Jr. vs. Al-Farouq Aminu. Potato chip stats, empty calorie numbers, Good Stats Bad Team Guy—these are all apt descriptors of the kind of year Hardaway is having. Sure, he’s putting up 23.4 points per game, but his assist-to-turnover ratio is nearly 1:1 (which means for every assist a player makes, he also makes a turnover), his usage rate is a whopping 30 percent, and he’s shooting only 41 percent from the field. Needless to say, Tim Jr. wouldn’t be putting up those numbers if Porzingis was around; KP is the far superior player and the future, while Hardaway is just a wing player the Knicks overpaid. Still, shooting 35 percent from three-point range on almost nine attempts per game bodes well for his prospects playing second fiddle in future. Hardaway is a threat from outside, and shooting fewer attempts (and not having to shoot them while being the defensive focus) should push that percentage toward the high-30s. Prediction: The Knicks stink. Blazers win. The Skinny: When last we saw this team on the 6th of November, they were getting their butts handed to them back in Portland. Giannis Antetokounmpo had 23 points but also had six turnovers, CJ McCollum shook off his early slump by exploding for 40, Evan Turner had a double-double, and the Blazers won despite Lillard shooting 5-of-15 for 13 points. Everything went right for Portland, and wrong for Milwaukee. After a blistering October, the Bucks are just 4-4 in November so far, cooling off from their league-devouring pace. They did have the high of destroying the Warriors, but they’ve lost to Memphis and the Clippers. I still think Milwaukee is one of the top teams out East, but the gap might close pretty quick. The Boston Celtics have loads of talent, the Philadelphia 76ers just added Jimmy Butler, and the Indiana Pacers lead their division as of Sunday night. How the Bucks respond after regressing to the mean, and to the moves made by their competitors, could determine their season. Matchup to Watch: Giannis Antetokounmpo vs. everyone. Antetokounmpo is the kind of superstar who can be only be stopped by a whole village—and will still dunk on all the villagers at once. Five pairs of eyes are on him all at once. Basketball-reference lists his “position” as Power Forward and Shooting Guard and Point Guard and Small Forward. Not kidding. LeBron James flirted with the concept, and Kevin Durant has attempted it, but we can probably say that the Greek Freak is the first player who can credibly play any of the five positions on the basketball court at a superstar level. Young Magic Johnson might have an argument, but Magic made such a fuss about playing in the backcourt that I can’t define him as anything other than a point guard. How about we just call the MVP candidate Antetokounmpo a “basketball player?” I think he’s earned the right to not be labeled traditionally. Prediction: I got the first game wrong, but I’m still going to bet against the Blazers here. I’ve seen what Antetokounmpo can do against Portland; Rip City got lucky last time. The Skinny: Drama! Suspensions! Discord! Stephen Curry having leg issues again! Draymond Green calling Durant a female dog! The Warriors have had their troubles recently, but I don’t think there’s blood in the water yet. They still have the West’s second-best record (behind Portland), and they’re more interested in playing the long game; Curry is going to be brought back slowly from his injury, and the team sent Green away to heal up his toe injury (and probably to allow him and Durant to cool off a bit). Having had plenty of toe issues myself, I understand Green’s bad mood lately—toe pain is no joke. I’d show you what my right big toe looks like after a long week of work, but I’d probably get fired for even trying to upload that. We’ll just say having a toe that resembles ground beef hurts very much, and leave it at that. Matchup to Watch: Kevin Durant vs. Al-Farouq Aminu. With Curry and Green likely not playing this game, the onus is going to fall on Durant to be the alpha and omega on both offense and defense. Durant can do it; he’s learned to use his unnatural speed for a seven-footer, not to mention all that length, to be a major nuisance protecting the rim. And if you’ve paid any attention to the NBA at all over the last decade, you don’t need me to tell you what this guy can do when he has the ball. Kevin Durant and Michael Jordan are either one-two or two-one on the Pure Scorers All-Time List, and I’d give the edge to Durant because he has nearly all of MJ’s skills in a seven-foot body, with the shooting accuracy of Larry Bird. Chief better eat his Wheaties for this one. With the injuries the Warriors are dealing with, KD is looking to channel his OKC days. 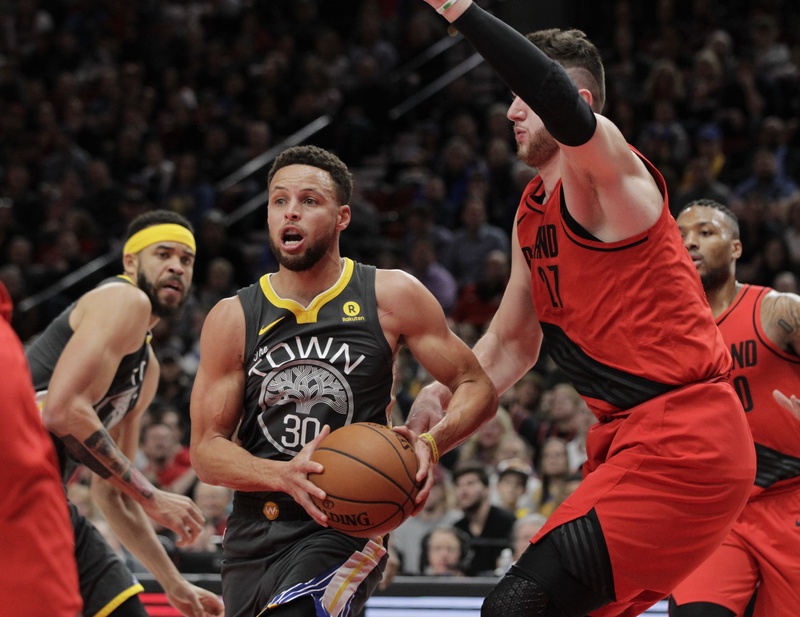 Prediction: While Portland is currently ahead of Golden State in the standings, I doubt Steve Kerr cares too much whether the Blazers steal a win at Oracle. Durant gets big numbers, but the second unit carries Rip City to a statement win with a #*Asterisk. The Skinny: I’ve been very impressed with Tobias Harris this season. I know the Western All-Star scene will be crowded AF, and frontcourt players in particular will find it hard to make the roster (even after Kawhi Leonard was traded to Toronto, the West will just replace him with some guy named LeBron James. I hear he’s pretty good at basketball), I personally hope Harris can find a way to squeeze onto the team. The Clips are 10-5 as of Sunday morning, and Harris is averaging 21 and nine with 51/41/80 shooting splits. For a team without a true tentpole franchise player, and that is in transition from one era to the next, Harris is making a strong case for himself to not only stick around LA after his contract expires this summer, but to be a major part of Steve Ballmer’s and Doc Rivers’ plans. This upcoming free agency period should be exciting for Harris, and not only because 2019 is looking to be a good year for the players. Counting the times his eventual draft slot was traded, Harris has been a part of six trades in his eight-year career, including being dealt as a future pick by the Trail Blazers; acquired by Portland in the Jerryd Bayless trade with New Orleans, the pick that would become Harris was then part of the Gerald Wallace trade with Charlotte. Wallace was a useful and loved player here in Portland, but he’ll best be remembered in Blazer lore as the centerpiece of a trade that let the Blazers acquire the sixth pick in the 2012 Draft—AKA Damian Lillard. NBA transactions are quite the rabbit hole to jump down sometimes, and nerds like me just can’t resist being Alice. Matchup to Watch: Danilo Gallinari vs. Jake Layman. Another feel-good storyline for the Clips has been the resurgence of Gallo, finally healthy. The combo forward is averaging almost 20 a game while shooting a preposterous 46 percent from beyond the arc. Al those injuries might have finally sapped Gallinari of his athleticism, but he can obviously still shoot. Mo Harkless might be active again by the time this game happens, but I wanted to single out Layman because he’s been doing a very capable job filling in as a starter this year. Making the right plays most of the time, occasionally doing something spectacular, and blessing our TV screens with that gorgeous hair, Layman has been a bright spot. I wouldn’t mind if Layman developed into Gallinari Lite someday—hopefully without being so injury-prone that he tears a muscle in his nether regions. Prediction: Let’s be optimistic. Portland wins.